A copy of the telex announcing to the UK government that Argentina had surrendered in the Falklands War is to be auctioned, a day after the 30th anniversary of the start of the war. Sent by the commander of the British land forces, Maj Gen Jeremy Moore, the message states that the Argentinian forces have laid down their arms. The telex adds the Falkland Islands are "once more under the government desired by their inhabitants". It is expected to fetch up to £3,000. News of the auction comes amid rising tensions between Britain and Argentina over the islands' future. On Wednesday, it was announced that MPs from the Commons defence committee are to visit the islands. Meanwhile, Prince William is on a tour of duty there and HMS Dauntless, one of the UK's largest and most powerful air defence destroyers, is due to arrive in Falklands waters next month. The plan to send Dauntless prompted an official complaint by Argentina's foreign minister to the United Nations about the UK's "militarisation" in the South Atlantic, but Britain has insisted the deployment is routine. 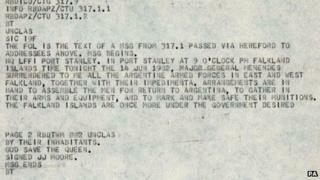 The telex reads: "In Port Stanley at 9 o'clock pm Falkland Islands Time tonight 14th June 1982, Major General Menendes (sic) surrendered to me all the Argentine Forces in East and West Falkland, together with all their impedimenta. "Arrangements are in hand to assemble the men for return to Argentina, to gather in their arms and equipment, and to mark and make safe their munitions. "The Falkland Islands are once more under the government desired by their inhabitants. God save the Queen. Signed JJ Moore." The message was sent via special forces to the Government Communications Headquarters on 14 June 1982 - six days before the hostilities officially ceased. It came to auctioneers Bonhams from what was described as a naval-related source. Bonhams chairman Robert Brooks said: "This remarkable document encapsulates perfectly the very moment of total capitulation by Argentina's 12,000-strong occupying forces in the Falklands. "It is a rare find of great historical importance and will excite considerable interest from around the world." It will go under the hammer on 3 April.